See the horrible parts of history brought to life in this sketch comedy. 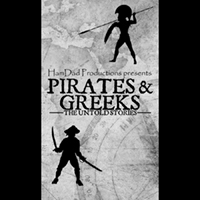 Adapted from the popular CBBC show Horrible Histories, based off the books by Terry Deary, take a wild and hilarious adventure as we sail the high seas with Putrid Pirates and philosophize with the Groovy Greeks. Great for children and adults alike, this show is sure to leave you in stitches! History jam packed into an hour presented in sketch form. This cast had a lot of energy. For 10 am I was impressed by the amount of oomph they bring to the material. Lots of the jokes were groaners but I still laughed. Being that this is a kids show I was obviously not the target demographic but I appreciated the energy and pace they brought. Your older children will love this. Younger ones are going to have a bit of a rougher time. By the end of the play I had trouble hearing what was going on because every child around me was so fidgety and the chairs so squeaky. The play was a little too text heavy for the little ones. A cute take on history with a kid-centric view. Definitely worth bringing older kids to.